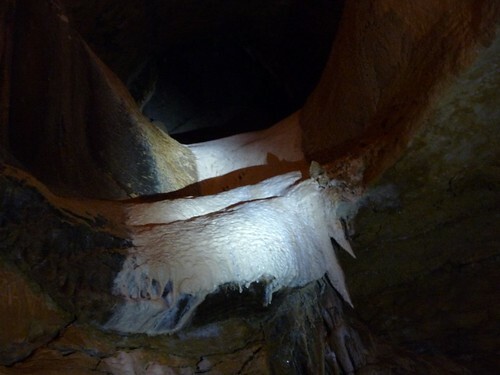 Mali Mish – Day 19: Caverns of Sonora and off to Austin, Texas. When we woke up today, we had an agenda. 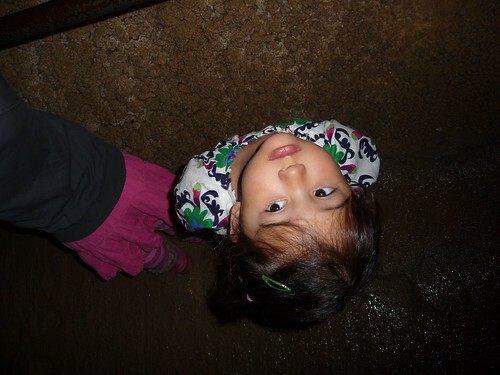 We were determined to get on the first tour into the caves so we can hit the road early to get to Austin. That means we had to get our tour tickets as the doors open at 9 am. The way they determine how early a tour starts is by when the first ticket for the tour is purchased. When someone buys the first ticket, it initiates the 30 minute countdown of the start of the tour. 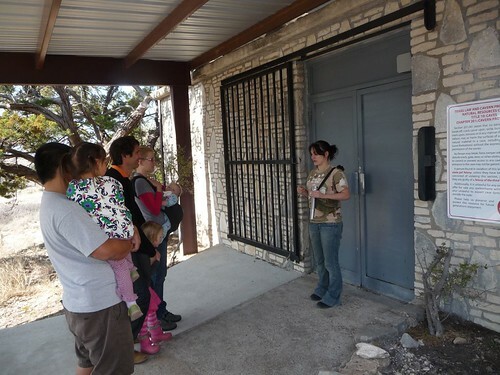 Since they will not take more than 12 people per tour guide, we needed to make sure we are the first to get there. Getting up and buying the ticket turns out was not a big deal. Even though we are still more or less on mountain time, we had no problems getting in there and buying the first tickets. 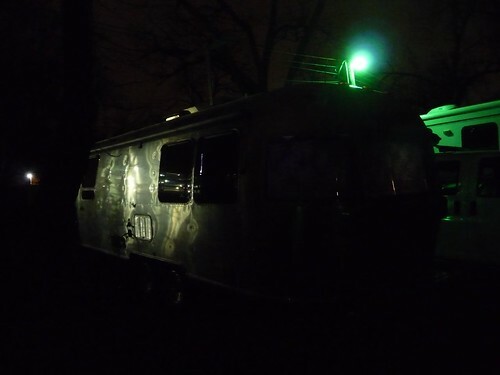 My problem came with I decided to use my 30 minutes to pack up the Airstream so we can be ready to hit the road the second the tour ends. It turns out, 30 minutes was not enough. 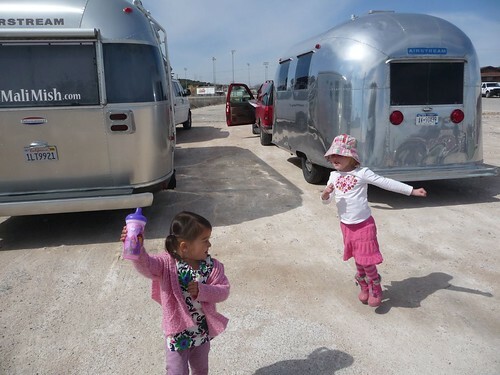 By the time I finished with the Airstream, the first tour could no longer wait for us so we let them go without us. 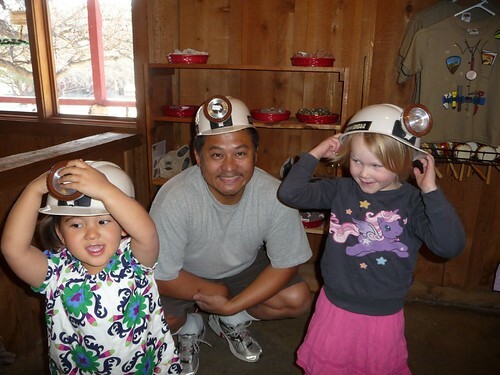 That gave us some time to tool around in the gift shop and try on some of these nifty miner’s helmets. I was actually glad to not be on that first tour. They were going so slow that our group actually caught up to them even with a half hour lead time. And we got to go on a tour all by ourselves. Our guide was a nice young lady who is an avid caver. 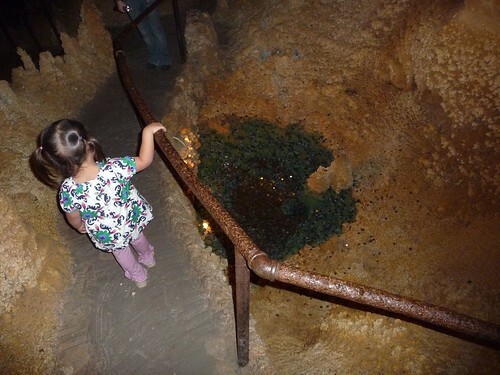 Unlike the Karchner Caverns tour we went on a year ago in Arizona, we were allowed to take pictures inside. 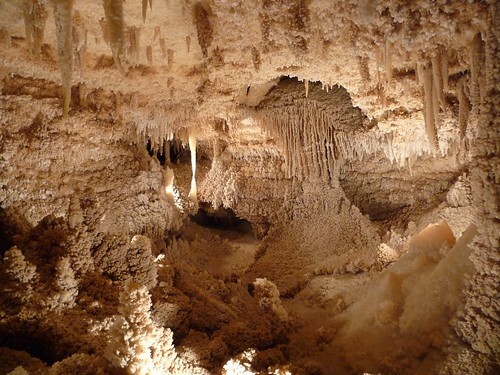 Karchner Caverns is part of the Arizona state park system while this one is privately operated. I don’t know what kind of training each tour guide goes through but our guide was fairly knowledgeable. I suspect that it is probably not the case for all of them because inside the men’s restroom, they posted a sign on the mirror that reads. “Attention RVers! 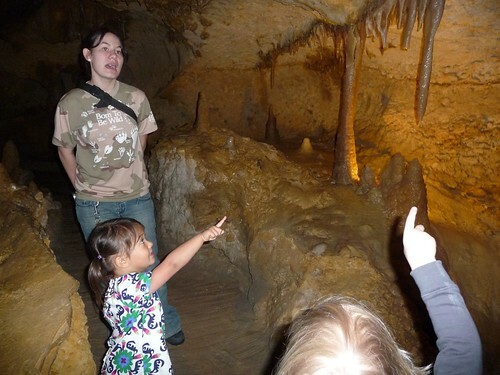 Get free hookups and wages by becoming a cavern guide.” Hmmm. Wow, Ava and Sophia, I am impressed. You are hired. When can you start? 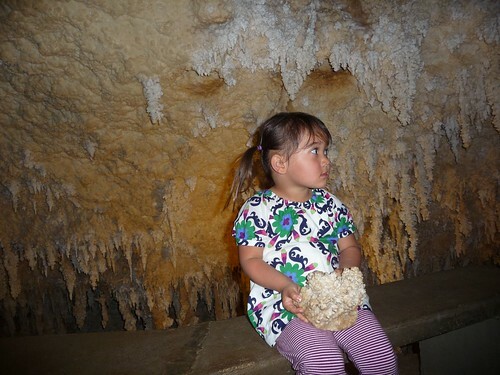 I think the 1.5 mile cave tour is wearing out this little one. She looks like has about had it. 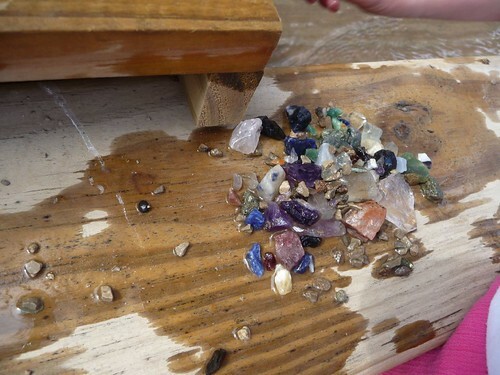 Something Ava has wanted to do is to pan for treasures. 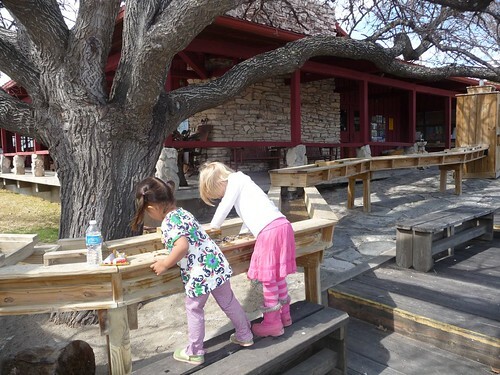 They had a little trough set up outside of the gift shop that lets her do just that. 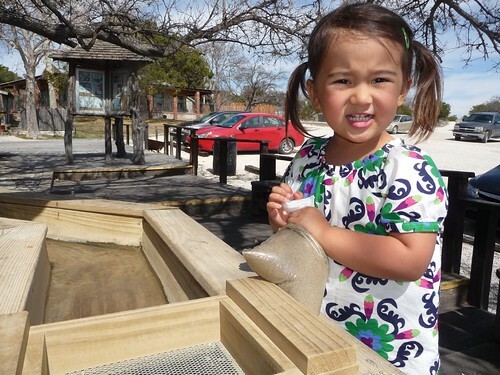 Although we know that the bag of sand is sprinkled with rocks by the shop keeper and contains no real treasure of any kind, we could not deny Ava the joy of pretending to be a gold prospector. Even Sophia came to join in on the fun. Look at that! Treasure! Great job girls! Let’s take these bad boys and get out of town before they know what kind of loot we’ve got out of that bag of sand! 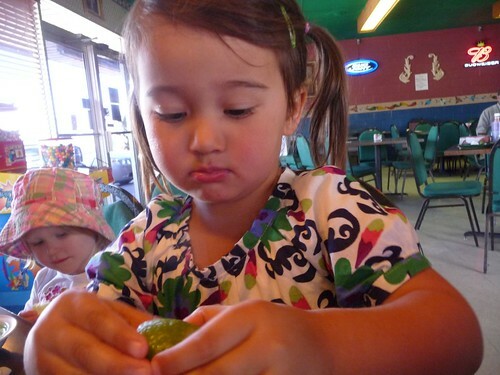 As we left Sonora, we stopped quickly at a Mexican restaurant in town called La Mexicana. It is the first meal we’ve had at a restaurant in Texas besides the Burger King stop yesterday. The carne asada and fajitas were delicious. But according to the ladies, the chile relleno was not quite as good. I don’t know but is Velveeta cheese supposed to be on the list of ingredients of a Tex-Mex chile relleno? As we got back to the parked Airstreams across the street, we said our farewells to our friends who we have been traveling with for the last 7 days. They are headed to San Antonio and then down to the gulf coast while we are headed to Austin. Our plan is in reconvene near Corpus Christi in a few days as they wrap up their trip that started back in September of 2009 by driving together towards Galveston, TX. They had arranged to have the Caravel shipped to England from there so they can begin their right-hand drive adventures across the pond near their home in London. We have had a blast these last few days and everyone is a little exhausted. Marlene got to get a few Zs in while I drove the 200 miles to Austin. Ava on the other hand got comfortable with her leg up while watching a little Aladdin on the DVD player. A little over a hundred miles down the road, we came across a little town called Fredericksburg, TX. It is an old settlement by German immigrants and ’til this day it has kept much of the German influence with its German restaurants and biergartens dotted along the highway thoroughfare. We did not find a big enough place to stop with the Airstream on the way through until we hit a Walmart near the end of town. There we stopped, rested, stocked up on provisions and filled our bellies for the next 70 miles into Austin, TX. 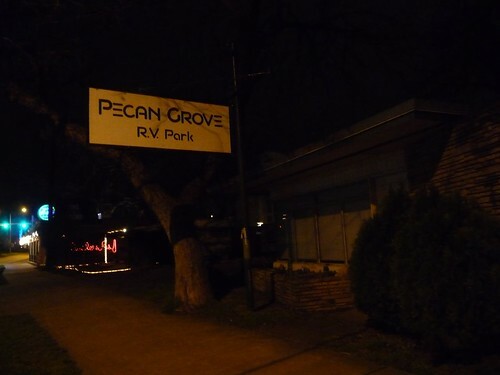 We had been trying to make reservations at the much-recommended Pecan Grove RV Park for the last several days but never were able to get someone on the blower. We had heard rumors on some message boards that the owners had finally sold out to condo developers and it was no longer there. Disappointed as we were we began to look for other RV park options near Austin but did not really find anything overly appealing. 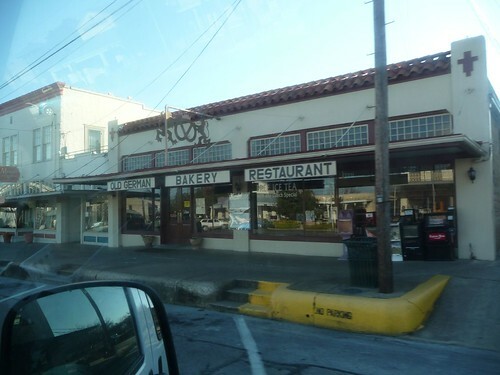 On a whim, Marlene tried one last time as we were about 45 minutes out while driving through Johnson City, TX. To our delight, someone picked up the phone. Not only were they still open for business, they had 4 spaces for us to choose from and we could pull in tonight and pay in the morning. And that’s exactly what we did. We made it there just before 9pm under the lit skyline of downtown Austin. We picked a spot amongst a half dozen other Airstreamers and settled in. 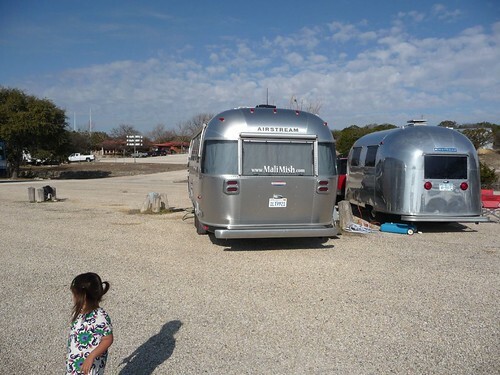 We were thrilled to be in Austin and nonetheless spending three nights right in the middle of town at Pecan Grove RV Park. Tomorrow morning the weather calls for snow.